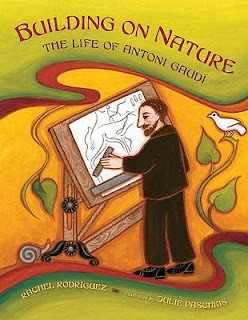 The Tea Box: "Building on Nature: The Life of Antoni Gaudì"
"Building on Nature: The Life of Antoni Gaudì", by Rachel Rodriguez, illustrations by Julie Paschkis, Henry Holt and Co., September 2009. By the same authors who had already created, in 2006, another interesting book on the life of Georgia O' Keefe*, comes a second work devoted to another important character of the artistic world such as Gaudì whom, like O'Keefe, introduced his own very personal application of nature's beauty into art. This picture book, for kids of age 4 to 8, tells about Gaudì's idea to represent the beauty of nature through architecture. Anyone who has seen "La Pedrera" or "Casa Batlò", just to mention two of the many works by Gaudì, cannot but remain speechless when approaching the visionary power of this incredible artist. Introducing kids to this multifaceted architect is, with no doubt, a wonderful idea that deserves being communicated. For the few things I was able to see, the book seems a very interesting work, also the authors seem to be invariably attracted by original, partly bashful characters, whom conducted very intense lives, partly veiled of mysterious discretion. To be honest I am not crazy for the illustrations: I believe there are some that are very interesting, while others are - to my very personal taste of course - too saturated, too mellow. Of course I realise that it's no easy task to translate Gaudì's work into illustration. It is anyway an appreciable effort, at times absolutely fitting. 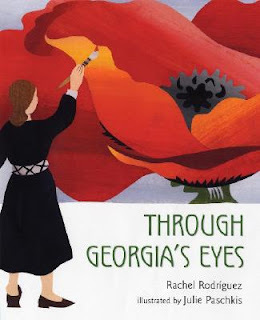 * "Through Georgia's Eyes" by Rachel Rodriguez, illustrations by Julie Paschkis, Henry Holt and Co., Febbruary 2006.